Sitting next to Jeff Pulver while Pablos (the hacker) was hacking his phone. Listening to Jeff say, “Oh my G-d,” over and over and sweating as Pablos played his voicemail. Since Pablos had tried (and FAILED!) to hack into my voicemail earlier that morning, I was both relieved and sympathetic. It was an honor to be the opening keynote. (watch Linda’s presentation on video at the DLD site). my comment: I must conclude that Master Pablos seems to have made a long-lasting impression on many of us. 🙂 I wonder when Pixar is coming out with a cartoon about a hacker dual – see magician dual in Prestige. A mini interview with Jeff asking what his top 3 moments were at DLD07. What would be your choice for the top 3 moments? What comes into your mind first? Amazing people. A “Pre-Davos Gathering of Leaders effecting the worlds of Digital, Life and Design. …and at the same time has a long lasting effect on you? Thanks, Jeff. Great replies. I am sorry I have missed the pool scene… Next time. No 1: That’s easy. Brainstorming with Tariq [Krim, founder and CEO of Netvibes] about cool new features for netvibes. Really funny. No 2: Ranting with Martin about hip and crazy people. Trying to feel much more morally straight. Kind of failed. No 3: Anshe Chung real life husband talking about how the character developed and got a life of its own. Cute and amazing at the same time. I also felt that newcomers who knew noone would have a hard time. People seemed just to be talking to people they already knew. Fortunately there was a very down-to-earth but equally crowded blogger meeting on sunday evening. There you could really get in touch with new people. Goo(g)d news. Soon you will start generating money on YouTube. How are they going to define self-generated? What will be the business model? There are several factors that could be included potentially. How to make it simple? For YouTube, the good news is that Google AdSense payment model makes it easier to switch into the new business model and send money to content providers. Or even better, that they can count on the excellent technology of YouTube, (pardon my French) Google. 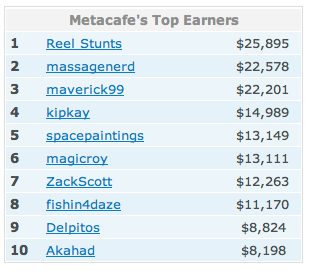 PS: the top earner on Metacafé, is not a simple user but a company: Reel Stunts Action Team, with several candidate films, but only one that generated all that 25.000 USD. Update: Thanks to Philipp Lenssen and Tony Ruscoe for posting it on Google Blogoscoped. Back home to Budapest, Hungary, and here comes a quick, subjective assessment on ‘what were the brightest moments at DLD07 conference:’ at least for me, and for Esther Dyson, with whom I was honored to get to Budapest city centre in the cab she generously shared with me. Where Are The Editors? (Tariq Krim, Craig Newmark, Caterina Fake, Arianna Huffington, David Sifry, Jim Spanfeller. Moderation: Jochen Wegner) (definite vote from Esther Dyson) (definite official programme No. 1 from me) As my laptop battery ran down right at this discussion, i.e. the culmination of the conference, I still owe a blogpost on it. Do not miss it. Esther’s vote goes for Mr. Hubert Burda. Mine goes for having an intriguing wifi-centred conversation with hacker-makecomputersexy Pablos Holman, and the like. Esther’s choice is all the interesting people at DLD07 (probably You), and talking to these people (unfortunately she did not go into details about it). There are lots of sessions that were also worth attending, and I wish to watch (again) on DLD conference 2007 video collection, as it was impossible to absorb everything. Thank you Hubert Burda Media, and the conference partners. Big thank you from a blogger, believer, and search marketing advisor who had a chance to experience the real vibe of 2007 – physically not simply virtually. It was an excellent, constructive thinktank meeting in Munich with truly interesting panel discussions, major market players, real stakeholders including business and design guys from big corporations, fantastic food and drink, mostly working wifi (quite a challenge for any conference organizor), professional conference settings/organizational solutions, and almost instantaneous video publication (!). And what about you, other bloggers, participants? What were your best moments? And what did you miss at the conference? a, I missed the opportunity to give feedback on the conference, b, missed some plugs to recharge easily running down laptops – maybe plugs, leads at the three, non-stage sides of the conference rooms would have been really convenient, c, some fresh (organic) food (fruits, salad) on the menu, d, some program points for facilitating networking. Undeniably, there were lots and lots of networking going on (on condition you already knew other people there), but there may be some solution for including newcomers, sort of team-building, and re-shaking oldtimers. e, I have jsut checked out youtube for dld07 tags, only 6 short bits are uploaded: convey the DLD messages, great interviews, keynotes on the central promotional site, please to reach out for more. Finally, a daring dream: what about a DLD conference which juggles with 1 more day including workshops? Tough job, but very worthwhile, I think. UPDATE: DLD07 post-survey form has been sent to every participant. Thanks. Part 3 of the Vlogging program at DLD07 is about the creator of lonelygirl15: Miles Beckett (a surgeon turned vlog-director, a remark in brackets no journalist would forget to add, neither blogger). The mini soap opera series started on June 12 2006, already on July 4 a lonelygirl15 monolog attracted half a million users within 24 hours. So the time for success was there within 3 weeks. Was it coming free? Not in a sense of free time: lonelygirl15 was acting as a real member of the community, actively participating in youtube life, like commenting on other people’s videos, thus calling attention to herself and her problematic life. Miles did not talk about it, but there must have been certain preferences for picking the hubs in youtube. How many hours per day have they spent on it in those 3 weeks is another question. Finally, what sort of contribution was it? I guess more than a ‘nice post, thank you XY’ which is so typical of linkhunters merely placing their linktraps for cathcing eyeballs. etc. They also have their own website now – so they have an independent site to monetize in addition to youtube. (and here comes the most important bit): Miles does not intend to go ahead simply with the lonelygirl tributes, he is actually trying to mash up the video series with social networking. He is trying to discover what online video communication is capable of. How? For instance, they are encouraging viewers, or rather, fans to contribute to the story with their own ideas, whether it is on the forum, or in a video response format. There are four characters now, and one of them was announced to check out the chatroom at, let’s say, 6 o’clock Pacific time. ‘Was announced’ is not a good wording though: what in fact happened was that the fictional character acting as a real person, plagued by real problems wrote to the visitors of lonelygrillgirl15 site that ‘I dunno what to do, but at 6 o’clock Pacific time I will go to the chat room.” So (s)he was asking for advice, and fans were eager to share: “servers crashed in fact…,” says Miles. Anyway, the fan-base is very-very interactive, there are 500-1000 comments per shot. Soap opera fans react very emotionally, e.g. they warn the characters what not to do (that reminds me of kids shouting to Little Red Riding Hood ‘the wolf is behind the bush’, and of moments when fans are actually raising money to save fictional lives. The good news is that we can get closer to a fictional existence to raise money for non-fictional people – like the guy who raised money for a new apple powerbook (!). Maybe the hundred dollar laptop campaign could use such fictional elements? Where is the limit? LG15 is still the number one on youtube, states Miles. There are about 1-1.5 million users/week: continuously. Despite the fact, that it turned out that lonelygirl15 is an invented, edited teenager. In fact, as it usually goes with publicity, the number of viewers, and more importantly, the number of ardent fans has increased manifold. A question for Miles: have they ever used product placement in the monologs? How exactly are they monetizing this endless program of heartfelt bedroom intimacy while preserving its ‘authenticity’? Recommended article on the project in Wired magazine. MoBuzz TV was founded 2 years ago, with the aim to provide good video content for mobile devices. 2 years ago, however, the bunch of operators in Europe weren’t ready with 3G, so Anil de Mello, CEO & producer of MobuzzTV, decided to put their video spots on the web. Today they attract 4.5 million viewers on a monthly basis. They have had major campaigns with Levi’s, Adidas, Disney etc. So it seems they are a lot more profit-oriented vlog (video blog) than RocketBoom, which is not only enjoying viral hype, but also features somewhat poor content. I am eager to check out more stuff on MoBuzz as the scenes with Karin (show hostess, so to say) were truly enjoyable (sharing statistics like ‘Apple is for the geriatric of tech geeks’). So what do they cover? Several areas for young/ youngish/ still youngish consumers interested in technology, business trends and entertainment, and not only in English and Spanish, but soon in German, Dutch and French, too. The blog posts a new 2-4 minute video every day (recorded in Madrid, Spain), which you can download directly from MoBuzz, from itunes, etc. So far they have produced some 1200 shows (multiplied by 2 minutes, you get 2400 min, i.e. 40 hour content). …Flickr site co-founder, Caterina Fake. Practically Marissa Mayer (the first lady awarded with the award) has said these few words so far. She will speak more tomorrow. He talked about the usual hacks of remote controlling your hotel TV set with your laptop, and checking what others are doing on their laptops in the hotel if you are bored. There was a few words about the MySpace friend-making machine (embedded java script), the project called ‘samy is my hero’, using keys (physical) keys to get through unnecessary obstacles, like doors, gates, building a sharkwhatever, and a lot of other hairraising things (other whatevers). But who is Pablos Holman? Watch his presentation on the video page of DLD07.